As principal of Solanna Design, LLC. 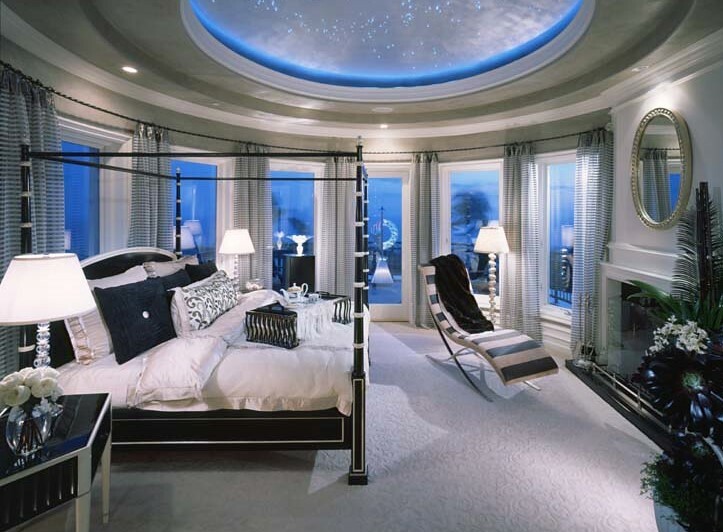 Anna Shay is known for incorporating her love for the art of fine craftsmanship into her luxury residential projects. Utilizing exotic materials and cutting-edge technology, Anna creates distinctive designs for an impressive roster of high-end clientele. 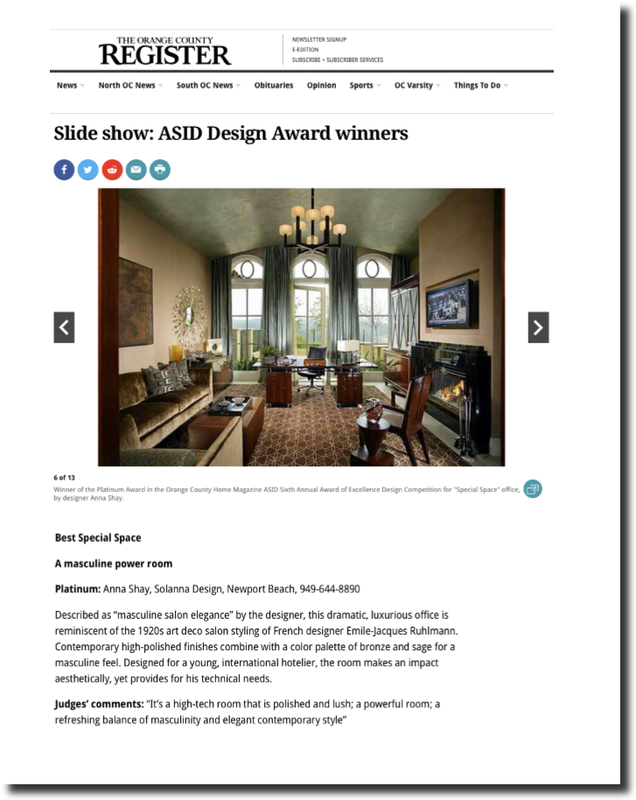 A ten time Platinum winner of the American Society of Interior Designers Awards, Anna's goal with every project is to create a captivating home that compliments the unique aesthetic and discriminating tastes of each individual client while addressing their lifestyle needs and desires. Having traveled extensively throughout the world, Anna's style is informed by her insights into old traditions, as well as her connection to fresh, contemporary design. These cultivated instincts have won Solanna Design numerous accolades in both local and national publications such as Robb Report, Traditional Home, Wall Street Journal, OC Home, The Orange County Register and most recently Tahoe Quarterly Magazine. June 2001 "BEAUTY BY DESIGN" - "Small Bedroom"
September 2006 "OPEN HOUSE" - "Double the pleasure"
June 2007 "HOME, SPECTACULAR HOME" -"Beauty and the bath"
April 2001 "GOING HOLLYWOOD" "Art Deco Style Home Theater"
September/October 2002 "REINVENTION BY DESIGN" "Ocean Front Home"
May 30, 2003 "THE HOME FRONT" "Letting the Sun Shine In "
November 2005 "THE FINER POINTS OF HOME THEATER"
2005 "DESIGNED IN ORANGE COUNTY"
February 17, 2012 "One on One with Anna Shay - Creating a Complete Spa Experience in the Home. 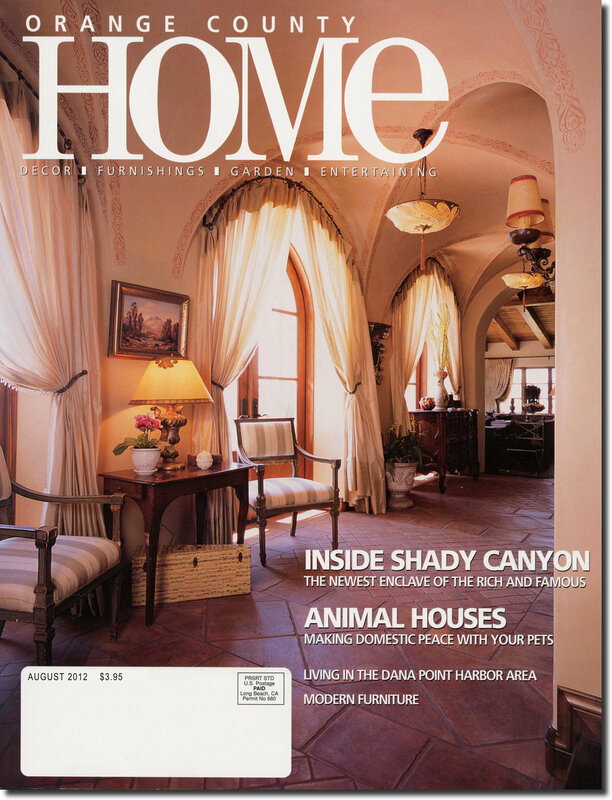 October 2001 - "The Celebrity Next Door"
August 2012 - "Inside Shady Canyon"